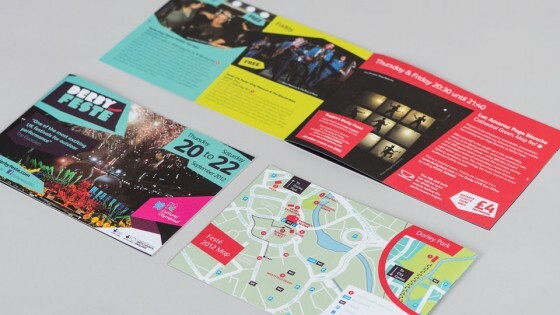 We’ve been working closely with the organisers of this years Feste to produce the printed materials for the event. The Feste which takes place on the 23rd and 24th of September 2011 see’s the return of Sarruga who thrilled audiences in 2007 and 2008, with another of their jaw-dropping acts. Sarruga will present Peixos, which will see the city centre transformed into a spectacular seabed where giant illuminated fish and creatures from the deep represent the inhabitants of the sea as they move through the streets of Derby. Allow yourself to be lured into the experience by vivid colours and special effects, as music, sound and light immerse you in the beautiful ocean. Join the parade towards a fantastic finale at Cathedral Green. There will be events all over the city so stay up to date by visiting the website derbyfeste.co.uk, or following on Facebook and Twitter.